Before I get started telling you about sturgeon fishing let me tell you that I have no personal experience with these fish, not yet anyway. Sturgeon fishing has been on my “must do” list for some time now. In order to have a chance at catching one of these intriguing fish it is not only important to be at the right place at the right time, but also to learn as much about the sturgeon, their habitat and fishing tactics as possible. And that is exactly what I have been doing lately. 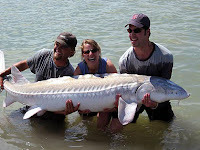 It seems that it is not a very difficult task to get a chance at a sturgeon provided the fisher knows where they are. Besides knowledge about the species some specialized tackle is required. First I want to share with you some facts about sturgeon and then we will look at the tackle and the different tactics that are used to get a sturgeon on the fishing line. The sturgeon lives along the Pacific shore of North America from the Aleutian Islands down past British Columbia to Central California. It is the largest freshwater fish in North America. A white sturgeon can weigh more than 1500 pounds (680 kg), and grow to 15 feet in length and can live well over 100 years. This huge fish prefers slow moving rivers, such as the Fraser River system here in British Columbia and the Columbia River in Washington state. Sturgeons are opportunistic bottom feeders. Their excellent sense of smell makes it easy for them to find fish cadavers, salmon eggs, clams and other food. The physical appearance of the sturgeon has changed very little since they first appeared over 175 million years ago and thus they have the appearance of a very ancient fish. Here in British Columbia we’re very lucky to have a stable thriving sturgeon population. Although we can fish them all year round (catch and release only) they never received the same pressure as other fish species have. Sturgeons are mainly fished in the months of March and April. The biggest threats to the sturgeons are environmental concerns such as mercury and chemical pollution of the water and destruction of the habitat. Sport fishers unanimously agree that for sheer size and power there isn’t a fish swimming any where in freshwater that even comes close to the white sturgeon. According to some of the stories I have heard it is quite common to do battle with a sturgeon that can last anywhere up to four hours. To me this comes as no surprise as catching 500 pound sturgeon on the Fraser River happens fairly regularly. Landing such a monster is not like reeling a salmon or big trout out of the water and onto shore or into the boat. Besides sheer muscle strength and endurance, special tackle and tactics are needed. While a sturgeon fishing setup does not have to break the bank and can be had for around $150 dollars, special attention needs to be paid to the rod, reel, line and hooks. Typically a sturgeon rod is anywhere from six to nine feet long and preferably it is made of a one piece plank to provide enough lifting power and backbone to turn a big fish. A rod with a medium to fast action is just about right to give you the sensitivity needed to detect a bite. Coupled with a levelwind reel capable of holding at the very least 250 yards of 80pound line. Many seasoned sturgeon fishers prefer braided nylon line for its strength and abrasion resistance in the 80 to 100 pound range. Leader material should be heavy 40 to 80 pound quality line. Most anglers I talked too seem to prefer hooks in the range of 7/0 to 10/0 size at the business end of the line. One experienced sturgeon sport fisher told me: “I have seen a sturgeon straighten a 8/0 hook on more than one occasion, so don’t be shy about using large heavy duty hooks. 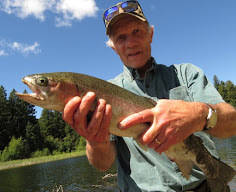 This ain’t trout fishing you know.” Weights can range from 6 to 20 ounces depending on the current, depth and tidal influence to get the lure/bait to the bottom of the river where the fish are. As mentioned earlier sturgeons are opportunistic feeders. This means they key in on food sources that are present in the river during a given time. When the salmon are running the food consists mostly of deceased salmon parts and salmon eggs so using salmon parts and eggs as bait would make sense. In the spring when the Eulachon is in full swing the sturgeon key in on that food source. I have been told that there are also popular staple baits that will produce results at all times of the year and these include ditch eels, dew worms in clusters, and corn. The tactic used to fish sturgeon is straightforward. Either from shore or from an anchored boat the tactic remains the same. Surgeons are best fished in a stationary position, no trolling or floating, with the bait suspended just off the riverbed. These fish are not predatory and will not chase a trolled or reeled bait like a salmon, bass or trout would. In other words, once the bait is cast on a likely sturgeon travel route and comes to rest at the bottom of the river it becomes a waiting game. If the spot you have chosen does not produce any action pick up and move to the next. When you get a sturgeon on the hook and have fought him every inch of the way the next step is to land the fish. It is not advisable to land a sturgeon into a boat, should you fish from a boat. Remember, sturgeons have to be released again and heaving a large fish weighing up to 500 pounds into a boat not only could tip the vessel over but also injure the fish. Landing a sturgeon is almost always done on shore. When the sturgeon is tired out to the point that he cooperates the boat is maneuvered to the shore. The fisher jumps out, wades on land and reels the fish into knee high water. A few pictures are taken that make for lifetime memories of a unique fishing experience before the beast is returned to its elements. Sturgeons can get very big! When fishing for walleye on the St-Lawrence river around Montreal, you could see what we call here "The sturgeon's dance"! In June and July, they will quite often just jump out of the water and generate a big splash! We call it sturgeon dance too here in British Columbia. I agree with you, it’s an impressing show. The first time I saw it with my own eyes I was awestruck.